The ability of organizations’ to monetize their data continues to remain one of the key measures of success in the digital age. It’s no wonder that the five most valuable companies in the world - Google, Amazon, Apple, Facebook and Microsoft - continue their dominance through the collection, analysis, and dissemination of massive amounts of data. Just look at the rise of the “Chief Data Officer”, a role which organizations of any size have started to create with the goal of being to understand what data assets the company has, how to employ their use for better decision-making and ultimately be used to drive revenue, efficiencies, or uncover risk. Committing to a data-driven strategy is easy to do on paper, but one which many companies struggle to put into practice. It requires a unified vision across the organization, starting with an understanding of the firms’ “data readiness” and establishing a detailed roadmap that exemplifies these long term business goals. ComSource and our partners at LPA Software Solutions bring analytics to life by helping our customers build a defined analytics strategy and embrace a “data-first” culture to stay competitive and grow their businesses. Watch LPA’s webinar replay below to see how together we can pave the way to becoming a Data Driven Organization. A successful analytics strategy starts with a firm commitment from the entire organization, especially from non-technical stakeholders. Embedding a business-driven analytics strategy will require input and resources from every corner of the company, to both help understand what data is available and to identify the types of insights that would benefit each area of your organization. And yes, there is some level of investment involved - so understanding and prioritizing the rollout of an analytics strategy requires detailed planning and resource management before the first keystroke is even made. Have you budgeted properly? Do you have the right people and skills to support these initiatives? Working with a partner can help you understand the known unknowns to ensure your analytics roadmap is built for success from day one. Descriptive Analytics - “what happened?”. More likely than not, some level of descriptive analytics is in use today for summarizing business activities via multiple data sets. Descriptive analytics, however, only tell you what happened in the past and not necessarily what will happen in the future. Data intensive organizations can get by with these types of insights by, for example, simply comparing quantitative metrics to discern trends. However, little insight is provided into the cause or drivers of those trends… you need to know the right questions to ask and where to look. Diagnostic Analytics - “why something happened”. Diagnostic analytics takes analysis a step further, by drilling down into the data to uncover patterns, causality and dependencies. This is a great example of where an organization’s ability to aggregate, cleanse and normalize data from multiple sources (from inside and outside the organization) becomes a critical factor of success. Predictive Analytics - “what might happen”. After understanding the ‘what’ and the ‘why’ stories that your data is telling you, predictive analytics can extrapolate those trends and apply forward-looking reasoning that will inform your decision making process. 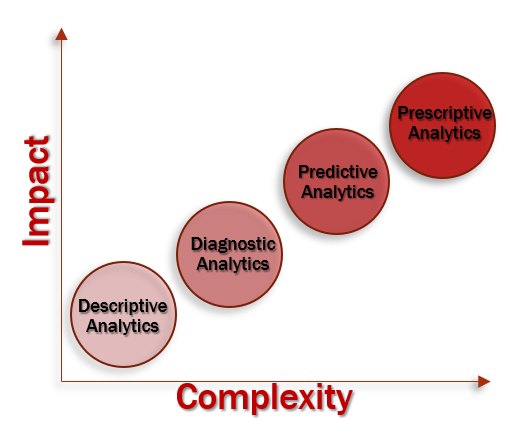 Prescriptive Analytics - “what you should do”. The last step with a comprehensive analytics strategy is ultimately to receive recommendations for actions to take to mitigate risk or capitalize on an opportunity. Companies who rely heavily on analytics for data-driven decision-making typically have an established analytics culture with proven benefits., and are now pouring millions of investment dollars into AI / Machine Learning in order to keep that edge. Once you have committed to investing in analytics and have a solid understanding of the data at your disposal, developing a roadmap for success is critical to… well… success. This is perhaps the most critical phase when establishing a new strategy, and where having a trusted partner by your side can be invaluable. A true analytics strategy will impact your organization in its entirety - each vertical (IT, Finance, Operations, Sales…) will have its own data to contribute, and unique reporting needs. For more on Data Analytics and Big Data in the coming weeks from ComSource as we discuss how Mosiac for Oracle is leading the charge for big data done better, and later this month on the world of IoT and how its coming faster than you think.